For this all-day special demo RESERVATIONS are necessary. If you plan to attend email your reservation immediately to Ron Lindsay at RSVP@channelislandswoodturners.org and mail your check to him: $35 for members and $45 for guests by October 19th. 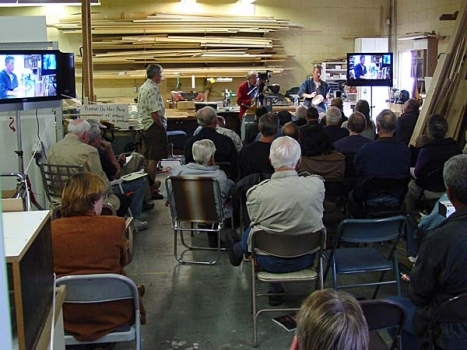 After that date if there is still room neighboring woodturning clubs will be invited to attend. Friends of CIW who read this website may reserve now. Don’t wait to send in your reservation! Lunch is included. The September 29th hands-on meeting at Oxnard High School was very well attended with over 30 present including 5 visitors many of whom joined the club. President Bruce announced that Gary Toro and Harvey Paskowitz will co-chair the club’s activities at the 2008 Ventura County Fair. Bruce and program chair Joe Levy, have been working on the program schedule for next year and promise a series of excellent demonstrators again plus our usual hands-on meetings and social activities like the BBQ (July 12, 2008) and the Holiday Party (Dec. 8, 2008). 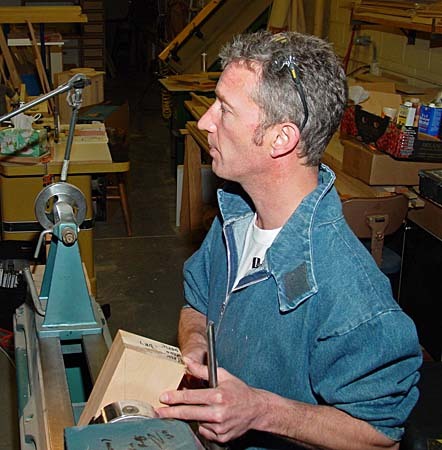 Our host for the hands-on turning sessions at Oxnard High School, woodshop instructor Chad Meyring, welcomed us again and requested members who were interested in mentoring students during class to check with him. He particularly would appreciate retired teachers who could substitute for him while he is attending woodturning meetings. 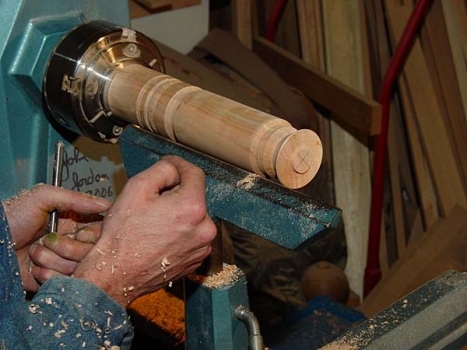 He thanked club members Joel Oksner, Russ Babbitt, and Tim Albers for finding parts and installing motors for the two Woodlathe bowl lathes that have been in the shop for several years. He now has 5 lathes for the students to use and soon will have an additional Powermatic when the school’s electricians finish the wiring changes. Photos from the show-n-tell table and hands-on session are below. Note that the November 17th meeting is one week earlier than usual due to the Thanksgiving holiday. Member Al Geller will demonstrate how he turns thin natural edge bowls. 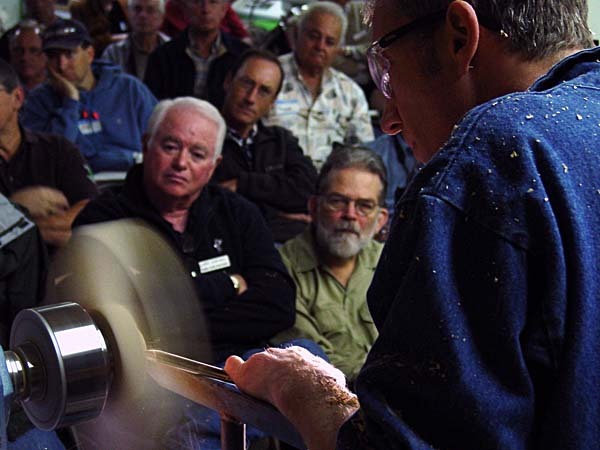 Al is an excellent demonstrator and accomplished turner so be sure to save the date. Election of officers for next year will also be held. Members will receive more information from President Bruce by email. Also save the date of December 1st (2007) for the potluck Holiday Party for members and spouses. Start thinking about and turning something for the gift exchange. 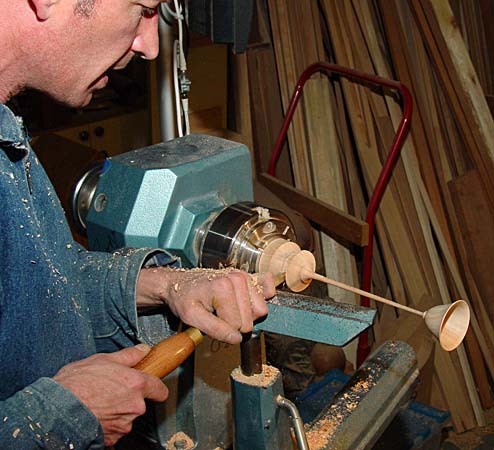 The Channel Islands Woodturners hosted Jimmy Clewes at the October 27th 2007 meeting for an all-day demonstration. 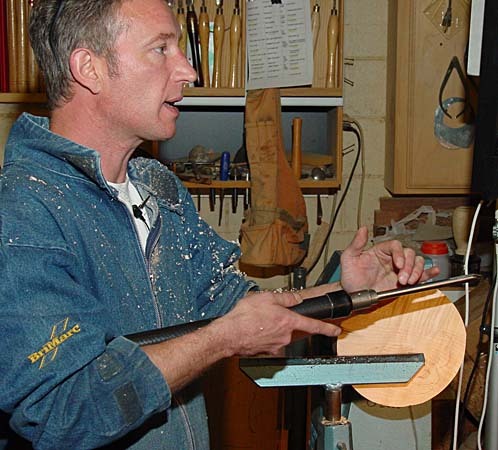 Jimmy is from Northeast England where he has a teaching studio and workshop at home (http://www.jimmyclewes.com). 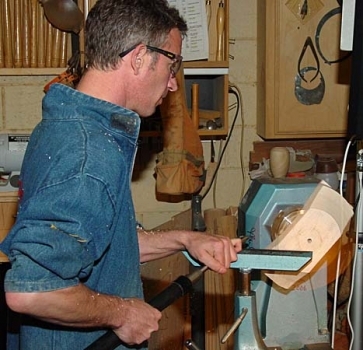 Jimmy also teaches at the Craft Supplies USA school in Provo, Utah and is an instructor at Canyon Studios in Copper Canyon, Texas (http://www.canyonstudios.org/default.htm) where he is exploring the combination of wood and glass as an art form. Jimmy had professional training in art and design, which is evident in his work. Jimmy started out by sharing his views about teaching. 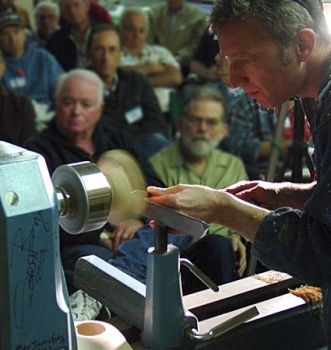 The phenomenon of woodturners making a profession by teaching woodturning is relatively new. It is an elite group of professionals and he thinks some are very arrogant. Contrary to some of his counterparts, Jimmy doesn’t teach that you have to do it his way. The techniques and methods that he uses are what works best for him, and he comes to share that with us his students. He says if you find another approach to a discipline that works better for you then by all means use it. Jimmy organized his demonstration around three pieces; an oriental box with a fitted lid, a disk-shaped object with which he demonstrated the application of gold leaf and aniline dyes, and a goblet with a tapered thin stem. 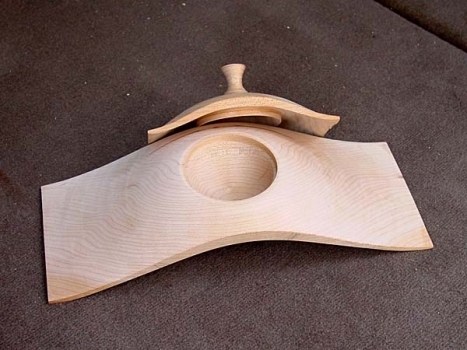 All three pieces were made from dry maple. The oriental box was made from a rectangular (approx. 2.5 x 4 x 12″) piece of maple lumber. Jimmy stated that the key to turning this rectangular stock was to run it at 3200 RPM and disregard that it’s rectangular! 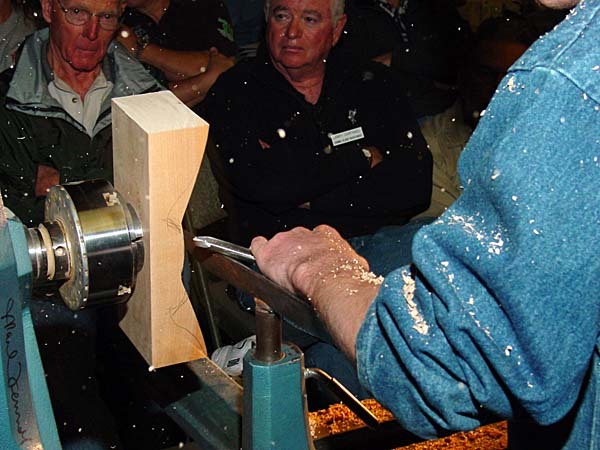 He first turned the base of the box holding it in a screw chuck and used a gouge with an Irish grind employing a push cut that he said is best for the interrupted cut. He made the box lid with a very close fit. He shared some tricks in making the lid. 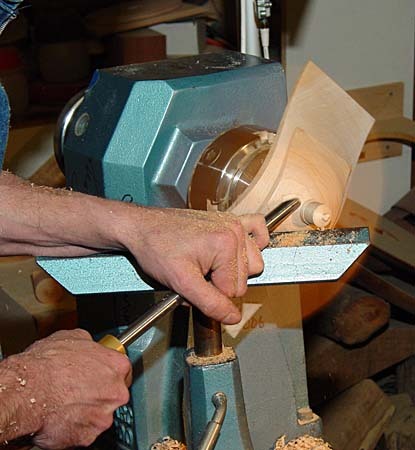 He returned the base to the scroll chuck, which then held the lid tightly in place, so that he could finish the finial on top of the lid. He suggested if the fit on your lid is loose, wet the wood with water to swell the fibers. 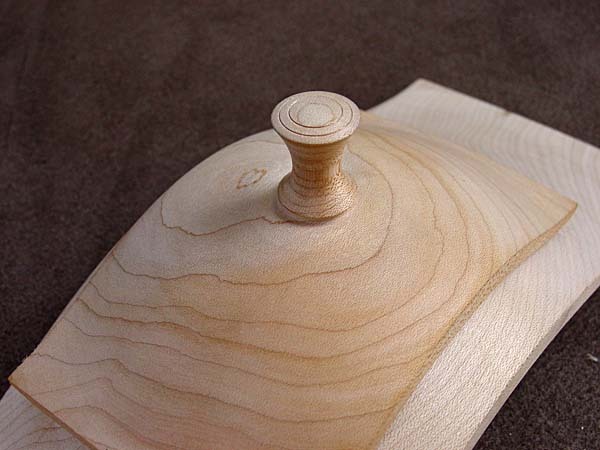 He used a taper fit on the recess for the lid as this allows for some error in the mating pieces. 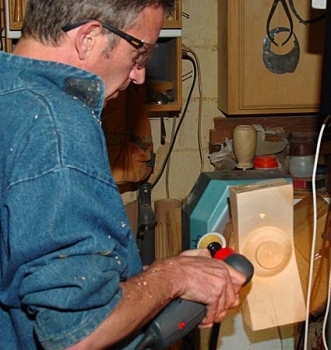 Even though his finish cuts were exceptional, he power sanded the rotating piece with a flex pad mounted to a right-angle drill motor. 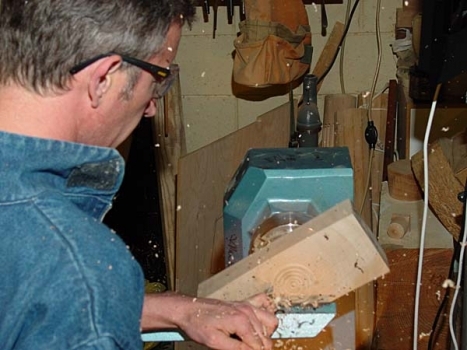 The fit of the lid was a little tight at first, but spinning it by hand back and forth allowed it to loosen. 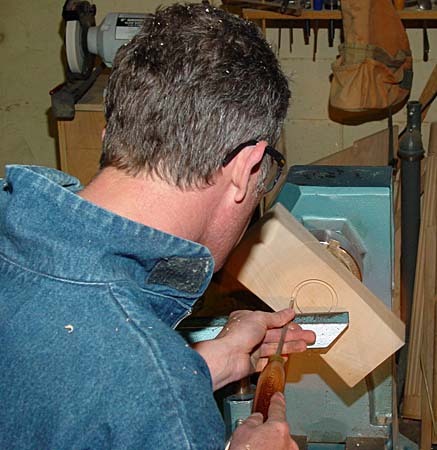 Jimmy suggested putting some paste wax on the recess or the tenon to ease the fit. 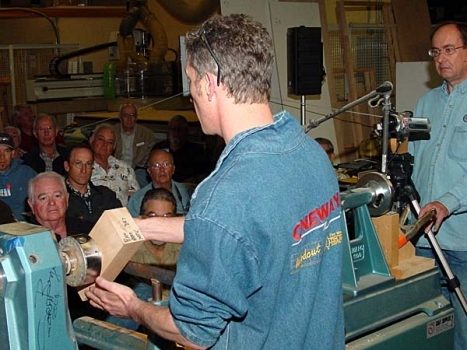 While making the box, he emphasized that he uses the Oneway sharpening system to sharpen his tools. 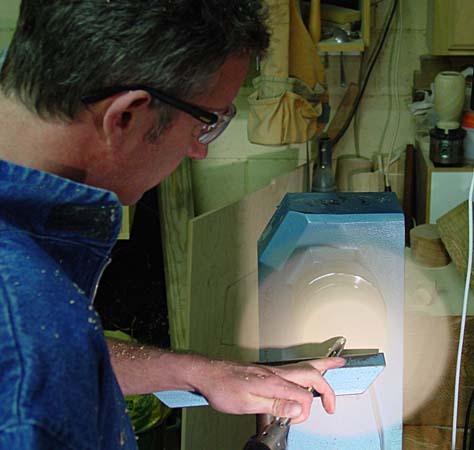 It is his opinion that much better and consistent results can be achieved by using a jig compared to grinding free hand. 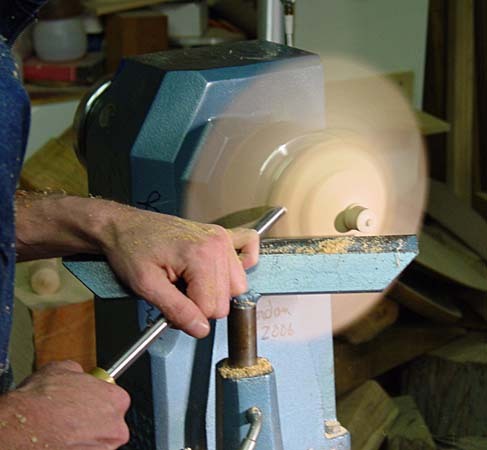 He used a diamond hone extensively to renew the edges on his cutting tools. He likes to use DMT diamond hones (http://www.dmtsharp.com/category/woodworking.htm). 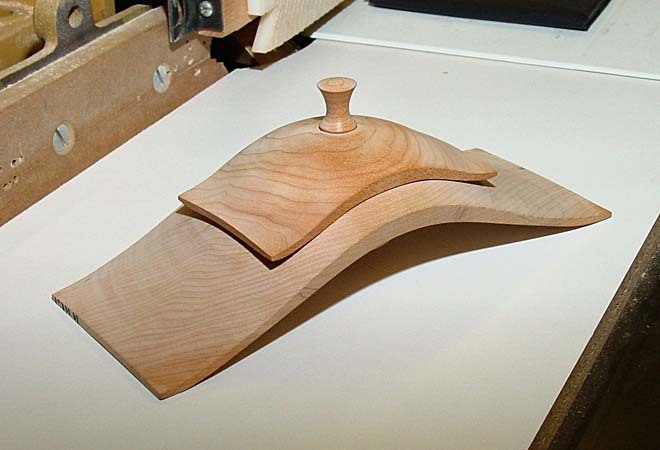 The next project was a disk-shaped object made from a 2” thick x 10” diameter curly maple blank. Once again he tuned this at very high RPM using a draw cut as the most efficient way to remove a lot of material. 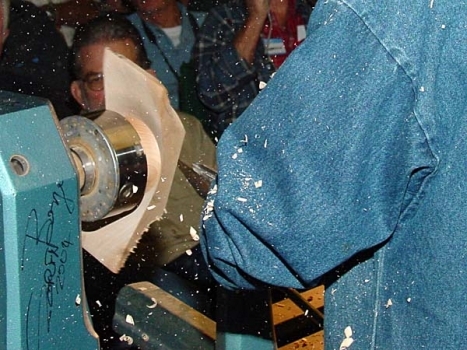 He made a very smooth finish pass using the back wing of the Irish ground gouge. Before coloring, he sealed the backside so the dye would not bleed from front to back. He sealed it with cellulose sanding sealer followed by 0000 steel wool then a coating with WaterLox (Tung oil varnish). Before coloring the front, he emphasized that the finish should be very good or else the dyes will highlight even minute sanding scratches. After his final sanding he sprayed the surface with denatured alcohol and burned off the alcohol by lighting the piece with a cigarette lighter (to speed drying) while slowing rotating the bowl by hand to prevent any localized burning. This was done to raise the grain in order to be sanded off again with finer sandpaper. 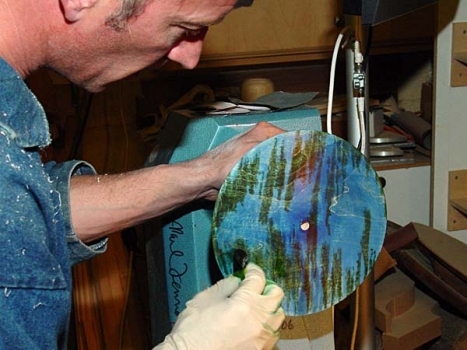 He colored the bowl with aniline powdered dyes dissolved in alcohol. 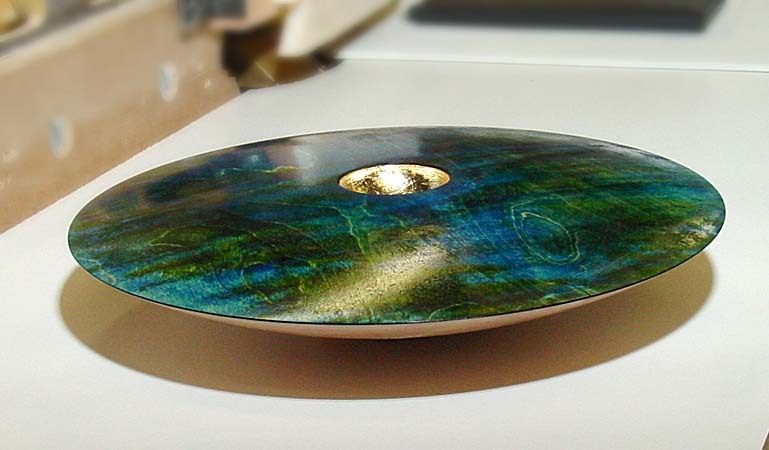 He first coated the whole top surface with blue, then dabbed in green and yellow, being creative within the flow of the grain in the curly maple. After the coloring was complete, he sprayed with alcohol to soften and blend the colors and then flamed-off the surface. (He used a spray bottle to lightly mist the surface to prevent the dyes from running.) When he was satisfied with the color, he sealed the surface by dabbing on nitrocellulose sanding sealer so as to not smear the colors further. 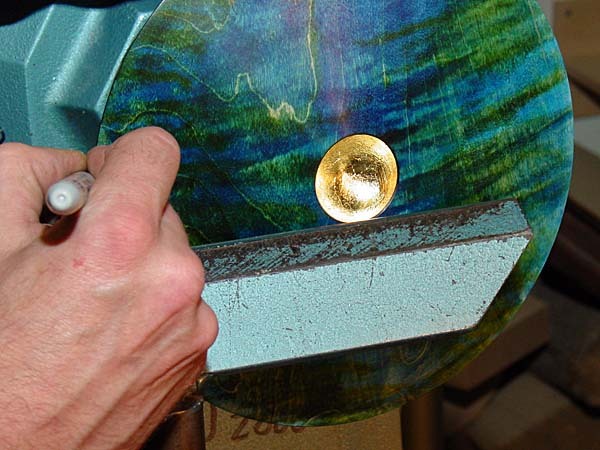 Before applying the “Dutch metal” (brass) gold leaf to the small pocket in the disk, he burnished the surface of the pocket and put a small chamfer on the edge of the pocket where it met the colored edge and colored it with a black marker pen. He brushed “gold size” glue in the pocket with a fine sable brush because any brush marks in the glue will show through the gold leaf. He flaked the gold leaf into the pocket and used a fine sable brush to bond the gold leaf to the glue and the metal foil flakes to each other. He finished the piece with WaterLox. Craft Supplies USA (http://www.woodturnerscatalog.com) carries the decorative metal gold leaf and the aniline powdered dyes. Jimmy purchases his aniline dyes from Clay Johnson at Choice Woods (http://www.choice-woods.com). Before creating the long-stemmed goblet, he focused on spindle turning technique. He lamented that many woodturners do not properly learn the foundational woodturning cuts. 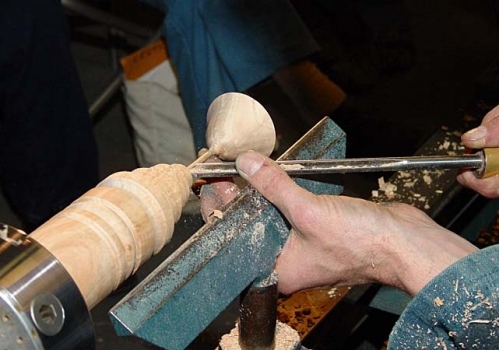 The best way to learn these is through spindle turning, and every woodturner would do well to spend some days practicing making pommel cuts as well as beads and coves. He demonstrated these disciplines on the goblet stock before proceeding to turn the goblet. It was fascinating to watch Jimmy turn the goblet. 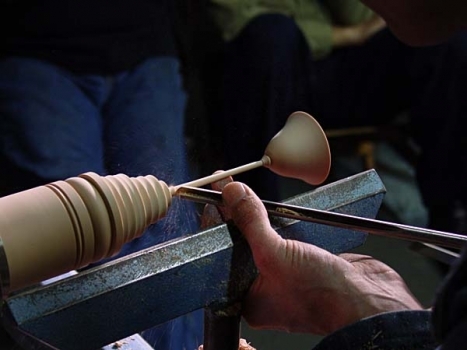 He worked quickly and efficiently turning the cup end first with a micro ground gouge and progressively working the stem down towards the base at the headstock. 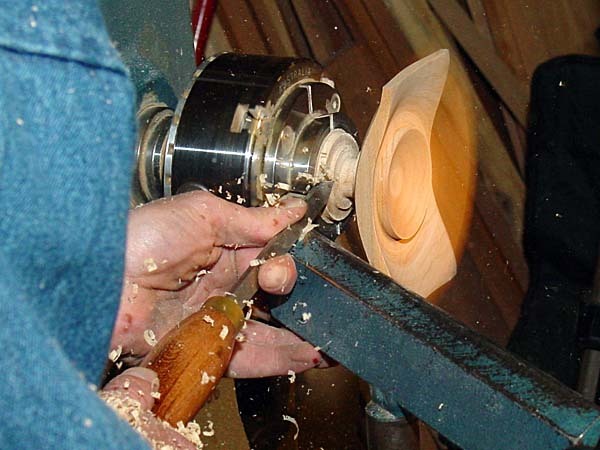 The maple stock was held in a chuck and turned without the aid of tailstock support. 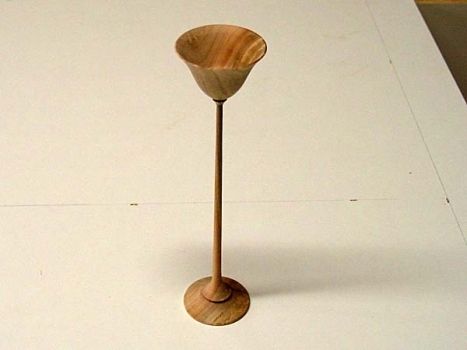 Jimmy suggested using some tissue in the goblet and bringing the tailstock up to lightly jam the tissue in the cup if support were needed.